Last week the East continued a respectable winning percentage against the West, finishing 9-10. Among the teams bullied, though, was the New York Knicks thanks to Dirk Nowitzki and Stephen Curry. Detroit also didn’t win either of their games against the West. Over the past month, though, the East is 40-46 against the West. Not great, of course, but definitely fine. I mentioned in my last non-conference post that the West’s best season ever against the East was in 2004 when they finished with a winning percentage of 63.3. Last week put a dent in the possibility of 2014 surpassing that mark, though it’s still possible. The West would have to finish 71-35, which can be slimmed to 64-35 when taking into account Philadelphia playing seven non-conference games that should hardly be competitive. POOR THADDEUS YOUNG. A pretty good chunk of non-conference games will take place this week, 28 total with each conference having 14 home games apiece. Indiana and Miami, far and away the best teams against the West, play five games while West playoff teams and their hopefuls play in 20 of them. A closer look at those games can be found here as well as bolded games I think the West will win, though I put little thought into it. Basically, the West was predicted to go 19-9 which is right on track to surpass 2004’s winning percentage. The rest of March as a whole has a ton of non-conference games, 98 to be exact with 50 of the games hosted by West teams. 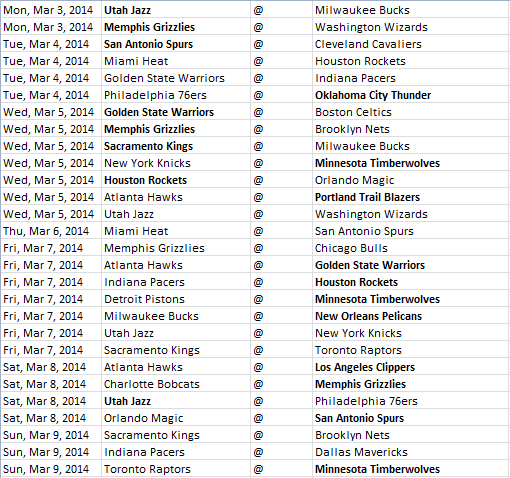 After that, it slows down significantly with nine games over the 16 other days. Below is a look at the league standings with non-conference games left. Conferences are separated by different sheets, so to view the West simply go to the bottom and click on sheet labeled after it. Dallas having seven less non-conference games than Memphis and Minnesota looks pretty huge, though the Grizzlies still have to play Miami not once, not twice, not three times, not four, not five okay they play the Heat twice, but still. They’re actually a pretty interesting matchup with Marc Gasol and Zach Randolph playing against the smaller lineups of Chris Bosh and either LeBron James or Shane Battier. Minnesota also faces an important stretch of non-conference games right when they need it most, all while Nikola Pekovic and Kevin Martin return to the lineup. They’ll host New York, Detroit and Toronto this week and Milwaukee in the following one. That’s a good reminder that while the East is holding its own as of late, a stretch against their teams is still seen as a way to beef up in the standings.